PrintJet Corporation is a leading provider of industrial coding equipment and supplies and a broad line of service. We manufacture replacement inks and makeup fluids that will save you money without compromising quality. We also offer new and refurbished Continuous Ink Jet (CIJ), Drop on Demand (DOD) and High Resolution Printers/Bar Code Printers that can handle all your coding needs quickly and efficiently. Our replacement parts and technical services are available for most for industrial ink jet printers and bar code equipment. PrintJet develops customized systems to deliver effective, reliable and accurate marking and coding for all industrial applications. 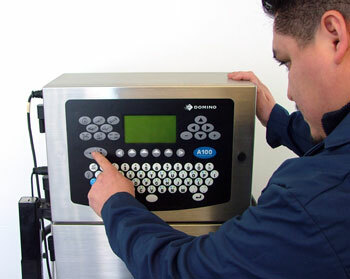 Our broad product line of printers produce precise product IDs with unmistakable clarity, and are trusted by the food, beverage, pharmaceutical, packaging and general manufacturing industries for all their industrial coding needs. No matter how complicated or intricate your coding requirements are, PrintJet has a solution that will meet all of the necessary specifications. We not only offer a full range of quality equipment, inks and parts, but also work individually with each customer to help select the right products for their application. You'll have plenty of options to choose from, as well as customized service from our experienced technical professionals. PrintJet can help you reduce printer maintenance and services with our extensive line of spare parts and technical services. We’re the best source for servicing and refurbishing your older, current equipment. Our expert technical staff has extensive knowledge of coding equipment from original equipment manufacturers (OEMs) including: Videojet®, Domino®, Willett®, Imaje®, Marsh®, Citronix®, Linx® and more. Years of experience and knowledge of the industrial printing and coding equipment and applications sets us above the competition both in quality of service and cost efficiency. Our in-depth knowledge of the industry puts us in the best position to save you money and keep your product lines up and running. Our goal is to improve our customers’ operations with increased speed and efficiency while reducing costs. We are focused on defining solutions that satisfy the needs of our customers, and strive to help them streamline their coding processes through our cost-effective solutions. For a full range of top-quality industrial printing and coding solutions, contact us today.